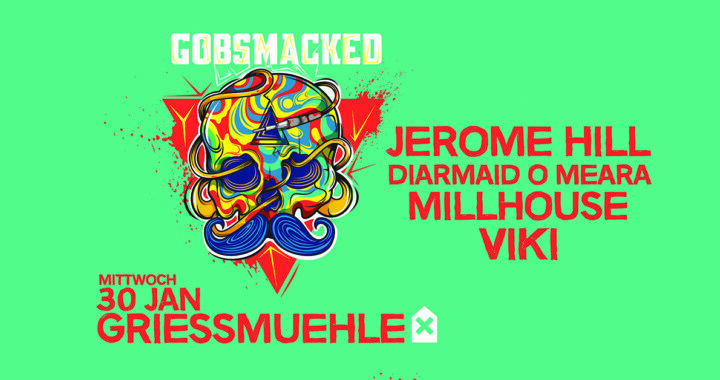 Gobsmacked returns to the Silo, and this time bringing label favorite and legend Jerome Hill to showcase his incredibly talented style. Joining him are Diarmaid O Meara, Millhouse and Viki. DJ since 1990, beginning with Hip Hop, Acid House, UK Bleep, Breakbeat and Techno, a residency throughout the mid to late 90’s on infamous London sound system “JIBA”, manager and music buyer for 2 record shops Trackheads & Dragon Discs in Camden, London, (1997-2004) Jerome has been a permanent fixture on the London scene and lives and breathes the music, his sets being educational and hedonistic in equal measures..
Berlin based Irish artist, deep into intense but soulful, atmospheric but industrial, heavy but spaced techno. Specialized in intense two and three turntable Dj sets. One of Irelands most notable international techno acts, Diarmaid O Meara has been pushing his brand of intense, and driving techno throughout European clubs and radio shows since appearing vividly on the scene in 2010. Known for skillfull and energetic DJ sets and steady releases across the genres top labels, including his own Gobsmacked brand, Diarmaid has been a steady fixture in the European circuit for years playing alongside countless heros from A.Paul to Sunil Sharpe, and Dave Clarke to Dj Rush. His style of techno production is consistently lauded by the greats and charted on the download stores, while his Audio Affair Broadcast show showcases the best underground noise and upcoming artists biweekly. Millhouse has been bangin’ out the tunes for almost 20 years, playing in venues throughout Ireland and more recently Germany. He has worked along side with some great DJ’s and producers in the industry; including Dave Clarke, Marco Remus, Luke Creed, Rhythm Technologies, Diarmaid O Meara, Dave the Drummer, Alex Calver, Patrick DSP and many more. Millhouse’s main influences have been Dave Clarke, Diarmaid O Meara and Luke Creed. In 2010, Millhouse saw his first few releases, firstly a collaboration with Luke Creed on Kamikaze Records. His first solo release on Gobsmacked Records’ 50th release along side other techno hard hitters Space Djz, Vegim, Concrete Djz, Diarmaid o Meara, Luke Creed and Karl Cullen. Since then Millhouse has had his tracks played by some of the biggest stars of the techno world and continues to play the freshest most original techno tracks. VIKI raised in Berlin, spent most of her youth in the punk and psychobilly scene. Coming from the high energy of punk she found her path in club culture and electronic music. Her passion ignited her to mix and quickly landed her gigs next to artists like VSK, Morbeck, Joseph McGeechan, and in clubs such as Tresor, About:Blank and Suicide Circus, as well as residencies at WeCallItTechno and Claires. She is a big believer that a good set takes you on a journey, just like a good book. Posted in Events and tagged Diarmaid O Meara, Gobsmacked, griessmuehle, jerome hill, Millhouse, Techno, Viki.